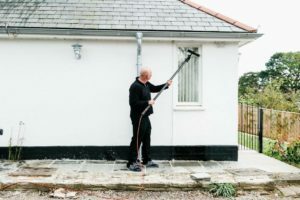 Truro window cleaning at an affordable cost! 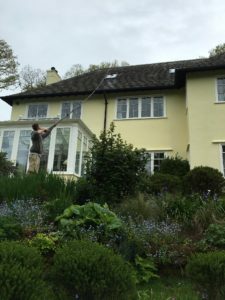 We have been providing a full window and gutter cleaning service for over 25 years in the Truro area. Using the latest reverse osmosis purified hot water system we pride ourselves on providing great results and service, with flexible appointments available. Prices start from only £10 for a small domestic property. To comply with Health and Safety standards we operate a reach and wash system using carbon fibre water fed poles with a range of up to 55ft. We empty all gutters and down pipes to ensure they are free from debris before washing down. All frames, cills and windows are cleaned to a very high standard, we operate a 100% satisfaction guarantee! To book an appointment or for more information, please contact us or telephone. We look forward to seeing you soon!